This article was originally published via Disobedient Media and is my own intellectual property. 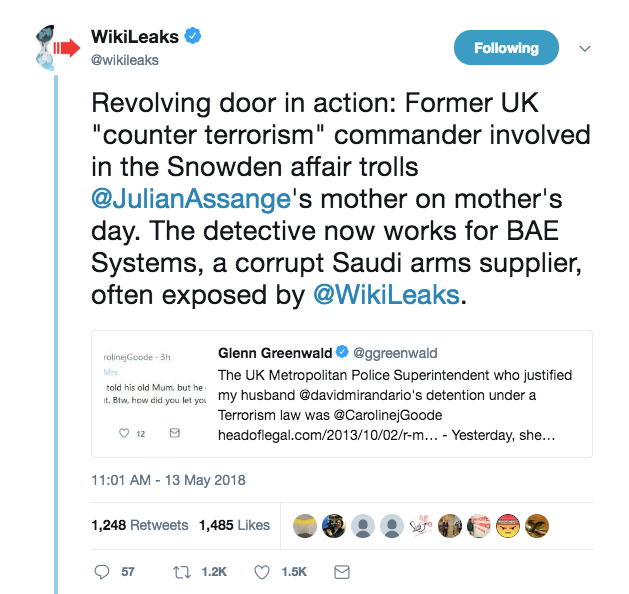 It's not enough for the establishment to silence and isolate Julian Assange: they are so terrified of the truth, that they also blatantly attempt to silence his mother, Christine Assange. 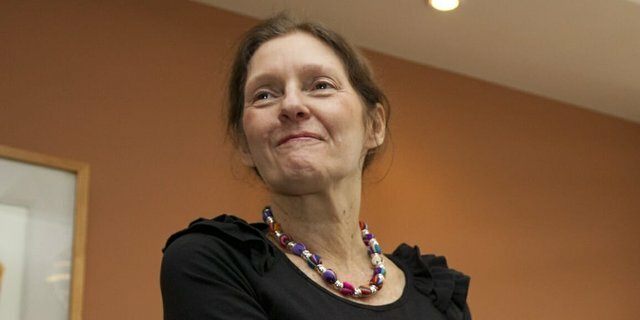 The unelected power structure's terror in the face of courage exposes their essential nature, and at the same time indicates the power that they ascribe to Christine Assange's voice. In light of the apparent attempt to silence Christine's voice, Dawson and I decided to re-start the stream immediately, in order to read the message from Christine that had finally come through. When this writer attempted to post an alert about the upcoming second livestream via social media platforms including Facebook, an incredibly unusual glitch occurred, unrelated to my internet connection, which I have never encountered in the span of Disobedient Media's existence. This author was prevented from spreading the word about a second live-stream of Christine Assange's sentiments. 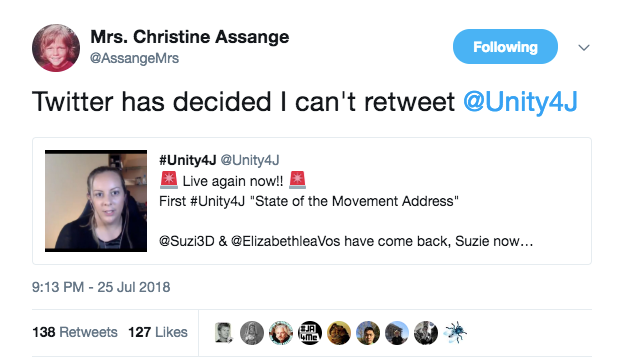 After her message was read to the live-stream audience, Christine wrote via Twitter: "Those steeped in corruption do not fight fairly or with honour. Their weapon of choice is smear. They use this to undermine support for honest courageous citizens standing up for freedom & democracy. What they fear more than anything else is an informed public!" Press reports recount that the social media platform was forced to deny accusations of 'shadowbanning' her Twitter account just two months ago. The Daily Dot wrote: "A notification ban or shadowban is when a user’s posts are hidden without making that user aware that their posts are not appearing for others. A shadowbanned user’s Tweets won’t show up in searches, mentions or in replies." 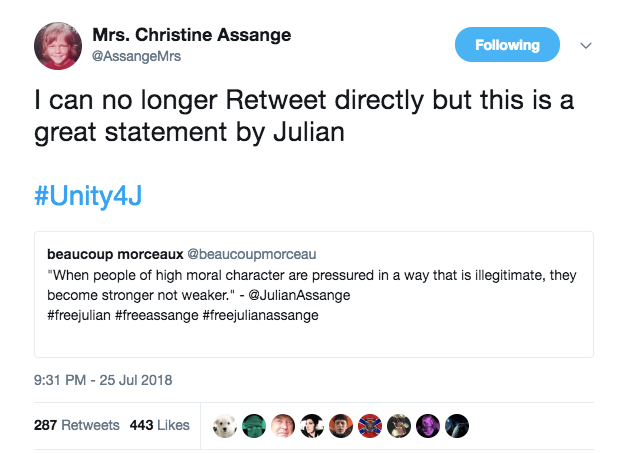 By reading Christine's message to those who re-joined the stream, by publishing the transcript for the public to read, and by documenting the multiple layers of censorship implemented against Julian Assange's mother Christine Assange, supporters have exposed the fact that the deep state is terrified of Christine Assange. 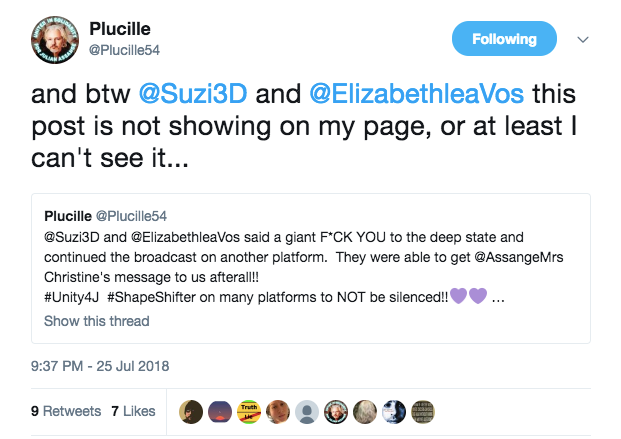 As Suzie Dawson said: "If they're gonna interfere with our streams, we need to stream more often; if they're going to try and silence Christine Assange, we need to uplift her voice." twitter is quickly becoming the official propaganda channel of trumpolini & the oligargs. they sensor social justice & occupy activists, but our dear leader threatening nuclear genocide is a-ok! While Twatter has the temerity to censor elected representatives, they don't DARE censor Trump. Can you even imagine what would happen to Twatter if they tried? They censor plenty of his supporters though. Recently it was demonstrated that they can't entirely get away with that, and they had to back off the censorship a bit. The powers that be fear peaceful protestors more than anything on this planet. They fear all of us with a loud voice. They wish we would all just bow down to their agenda going after Assange. Not going to happen Assange's rights are our rights.